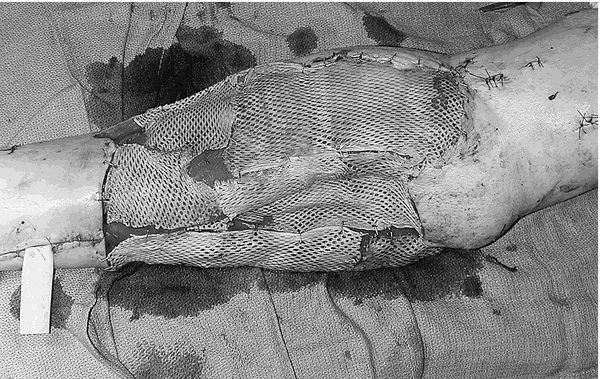 A graft of fibrous tissue, usually the fascia lata. 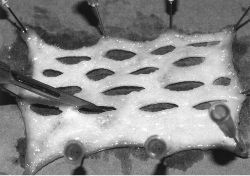 A graft using fascia, usually removed from the fascia lata, for repairing defects in other tissues. 2) Onal et al reported that cartilage grafts were significantly better than fascia grafts in terms of the graft take rate and pure-tone average. Summary of reported RCTs of cartilage and fascia grafts Cartilage graft and Author fascia comparison Study type Kazikdas et al, Cartilage palisade n = 23, Retrospective, (3) 2007 fascia n = 28 not an RCT Yetiser and Cartilage perichondrium shield Retrospective Hidir, (4) 2009 n = 47, fascia n = 66 Cabra and Monux, Cartilage palisade n = 64, Prospective (2) 2010 fascia n = 59 RCT Yung et al, (5) Cartilage graft n = 18, fascia Prospective 2011 n = 20; cartilage thickness RCT 0. 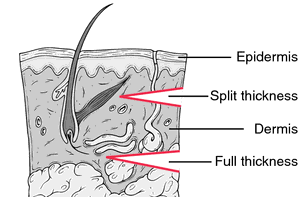 Fascia grafts used in the dorsum and sidewalls are held with suture. Between July 5, 2002, and July 29, 2003, we performed reconstructive cranioplasty with hydroxyapatite cement and a pericranial/deep temporal fascia graft on 7 men and 3 women, aged 27 to 65 years (mean: 54. Once the middle ear is inspected for the ossicular integrity, the dried temporalis fascia graft is placed. The temporalis fascia graft is shaped to the proper size needed for closure of perforation and is tucked into position under the anterior tympanic membrane remnant and onto the posterior canal wall. A second method is to elevate the skin flap at the surgical site and make a temporalis fascia graft. In patients with Attico Antral disease a modified radical Mastoidectomy was performed with type III Tympanoplasty and underlay fascia graft. In standard myringoplasty, a temporalis fascia graft is placed medially to the tympanic membrane remnant or laterally under the tympanomeatal skin flap. These techniques soon gave way to canal, vein, perichondrium, and temporalis fascia grafts.